I try to always have one sympathy card ready so that I'm not trying to create while emotional. It is a really sad time when our friends and family lose someone they love in death. We have a wonderful gift of being able to let them know that we are thinking of them and have taken time to make them a very special card or project to show them we love them and are thinking of them during their difficult time. I punched two daisy pieces from Smoky Slate cardstock and sponged them both with some Calypso Coral ink, concentrating the colour on the tips of the petals and the centre of the flower. I also added some Peekaboo Peach ink to the bottom layer of the flower. I added the greeting from Teeny Tiny Sentiments in Night of Navy ink to the punched banner and then masked the centre of the banner and sponged Night of Navy ink onto the banner ends. 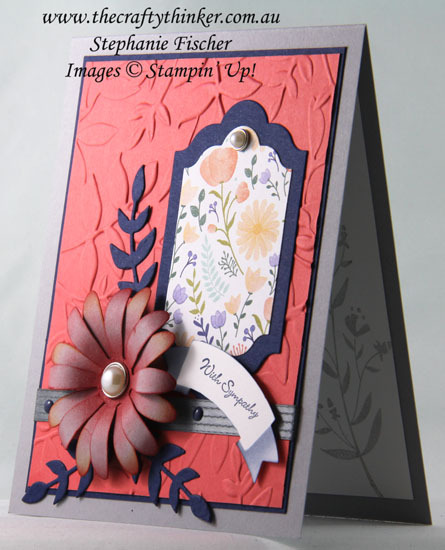 The flower and the banner are attached with Stampin' Dimensionals. I think the rest of the card is fairly self-explanatory. The greeting inside the card is from the Flourishing Phrases set and is stamped in Night of Navy ink. 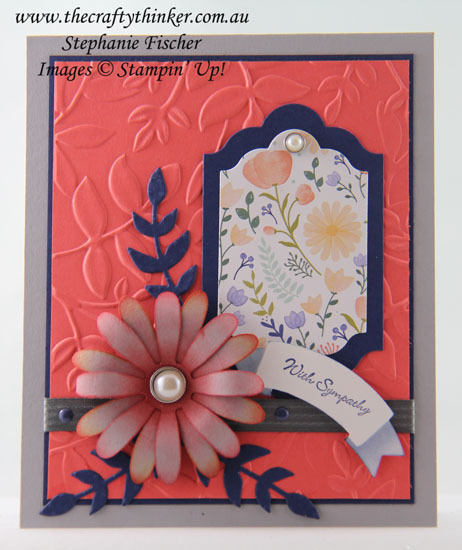 The silhouette from the Flirty Flowers stamp set is stamped with Smoky Slate ink, stamped off first.